More than 200 Benedictine College students made an 1,100-mile, 27-hour journey to Washington, D.C., to participate in the annual March for Life. This is the 33rd year the college has participated in the march. 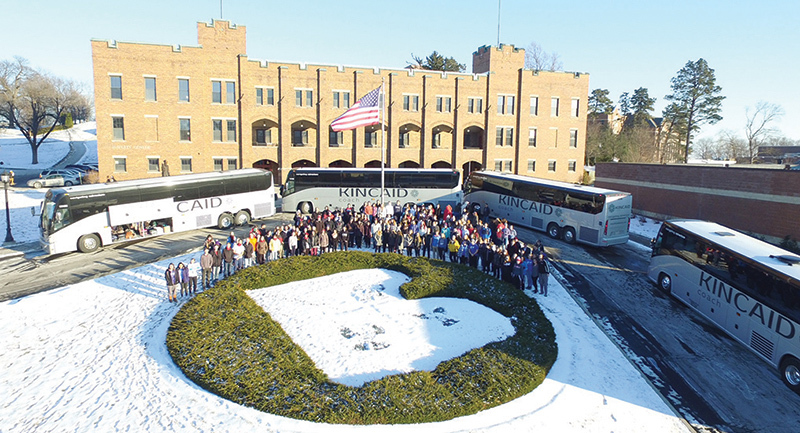 ATCHISON — More than 200 Benedictine College students here gathered for a picture in the chilly air the afternoon of Jan. 17, as they prepared to board buses for the 1,100-mile, 27-hour journey to Washington, D.C., to participate in the 2018 March for Life. Each year, Benedictine College usually brings the largest group traveling the greatest distance for the annual march. “We are the pro-life generation and we want everyone to know we’re not going to stop fighting for life,” said Kathryn Probst, the March for Life coordinator for Ravens Respect Life. Probst, a Benedictine College senior from Boylston, Massachusetts, has been a strong supporter of the pro-life movement since she was a child. Her mother worked at a crisis pregnancy center and began taking Kathryn to the March for Life when she was 11. Probst has attended almost every march for the past 10 years. It was at one D.C. march that she first connected with Benedictine College. “When I was a senior in high school, I saw this huge group from Benedictine College and they were leading the march,” Probst said. “I saw their enthusiasm for the cause and I wanted to be a part of it. Once at the college, she joined the Ravens Respect Life organization and began attending the March for Life with the group. Probst served as the March for Life recruiter last year, and took over as the overall coordinator this year. She has worked to promote attendance at the event and has organized an expanded program — complete with a Mass at St. Peter Church in Washington, a rosary in front of the Supreme Court building, and a gathering and Mass with other groups from the Archdiocese of Kansas City in Kansas. This year, Probst added the option for marchers to attend the Cardinal O’Connor Conference on Life, the largest collegiate pro-life conference in the nation, which took place in Washington the day after the march. The annual pilgrimage of Benedictine students to the nation’s capital started in connection to Kansans for Life. At that time, the school’s Knights of Columbus chapter took the lead and was a major promoter of the event. The first few years saw a handful of students go, but the numbers began to grow. In 1989, students at Benedictine College formed the Ravens Respect Life organization. In 2009, the Benedictine College presence attracted the attention of documentary filmmakers, who then featured Benedictine students in their film. “Thine Eyes: A Witness to the March for Life” was shot on location by a six-camera crew to capture the spirit of the annual march. It has now been seen on national television on EWTN and in theaters across the country.